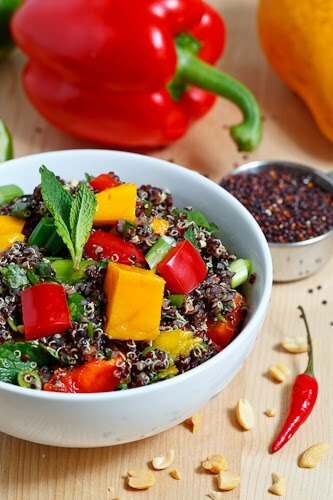 A colourful Thai style black quinoa salad with the perfect blend of salty, sweet, spicy and tart. Normally when I go to pick up quinoa they only have the white and red varieties but I recently came across black quinoa which I immediately picked up and I have been just itching to use it ever since. 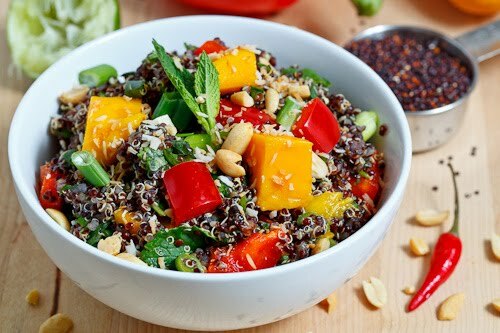 After thinking about it for a while I decided that the black quinoa would go well in a bright Thai inspired salad where it would nicely offset all of the colours. Sweet and juicy yellow mangoes seemed like a great place to start with the colours in the salad quickly followed by some red bell peppers and then some green onions, fresh mint and cilantro. One of the things that I like about Asian and Thai cuisines is that they often balance the sweet, salty, tart and spicy aspects of a dish with wonderful results so I tried to do that here making the dressing with salty fish sauce, sweet sugar, tart lime juice and spicy sriracha along whit a birds eye chili for heat. I finished the salad off with some chopped peanuts and some toasted coconut flakes. Bring the quinoa and water to a boil, reduce the heat to medium-low and simmer, covered, until the quinoa is tender and the water is absorbed, about 15 minutes. Mix the quinoa, red pepper, yellow mango, green onions, cilantro, mint and chili in a large bowl. Mix the fish sauce, sugar, sriracha, lime juice and zest in a small bowl. Toss the salad in the dressing and serve topped with the peanuts and coconut flakes. Wow! That looks delicious! I recently discovered quinoa and I love it! I love Thai flavor and incorporating that with the healthy quinoa sounds lovely. Hi this sounds really amazing! I found your blog searching for green curry paste which looks excellent and mine is getting there! I wanted to mention that I've made a similar dish with quinoa but I added coconut milk to it while cooking and that made it very rich and creamy and quite delicious. I thought it may go well with your recipe here too!! Cheers! A splendid salad! Colorful too. I don't think I've ever seen black quinoa before either, but what a great salad you've made with it! I'd throw in some chickpeas and call this a meal. This looks absolutely wonderful! I have yet to try Quinoa, but I've got to say, I don't know how I have gone so long without trying it! Hi Kevin! Thanks for the tip – I haven't even heard of black quinoa! Now I will look out for it. I tried black rice last week and it was delish! I had some cooked quinoa sitting in the fridge and was looking for something to do with it other than tabbouleh. I had to substitute a few items to use up what was in the fridge but it turned out quite nice. Thanks for the idea. I love anything with Mango. I'm gonna try this next weekend. Anonymous: Cooking the quinoa in coconut milk would be nice! Steve: I got it from the small shop in the basement of the Saint Lawrence Market but it was in a brand that I see at other grocery stores. Loved it! So yummy. I'm going o try cooking it in coconut milk next time. Great tip. Definitely going to make tis again… & often too! Joy de vivre: Thanks for the warning!